Rockets were invented by the Chinese, a spin-off from their invention of gunpowder--some time around the year 1000, perhaps earlier. Rockets added a new dimension to fireworks--another Chinese contribution--but, invevitably, they were also applied to warfare, as missiles to set the enemy's cities on fire. The British took notice in 1791, when Indian troops, under Tipoo Sultan, employed rockets against them. William Congreve, a British officer, developed a military rocket and in 1806 urged its use against Napoleon. "The rocket's red glare" in the US anthem refers to the use of Congreve rockets in 1814 in the unsuccessful British attack on Fort McHenry, outside Baltimore. Such rockets however had notoriously inaccurate aim, and their use declined as artillery improved. However, commercial rockets were sold for use by ships, for carrying a line to the shore in case of shipwreck. Still, rockets were the only credible way of reaching distant space. One visionary who realized this was Konstantin Tsiolkovsky (1857-1935), a Russian teacher who enthusiastically promoted spaceflight and wrote books on the subject, long before the idea received serious consideration. "It was one of the quiet, colorful afternoons of sheer beauty which we have in October in New England, and as I looked toward the fields at the east, I imagined how wonderful it would be to make some device which had even the possibility of ascending to Mars, and how it would look on a small scale, if sent up from the meadow at my feet." "I was a different boy when I descended the tree from when I ascended, for existence at last seemed very purposive." Order: complete patent application if necessary of nozzle and plurality; take out application on reloading feature; also complete application for electric pump; repeat calculation carefully, for smaller intervals; look up Darwin's theory of the lunar motion; and look up meteors. Also try a jet. The patent application was for US patent #1,103,503, granted in July 1914 together with an earlier one, #1,102,653. "Plurality" was Goddard's term for multiple rocket stages, and the patents also covered expansion nozzles and liquid fuel, although Goddard did not experiment with them until 1915 and 1922, respectively. In 1915, as assistant professor at Clark University, Worcester, he began experiments on the efficiency of rockets. He bought some commercial rockets and measured their thrust using a ballistic pendulum, a heavy mass suspended by ropes, to which the rocket was attached. The rocket was fired, and the height to which the pendulum rose provided a measure of the total momentum (mass times velocity) imparted to it. Goddard also used an equivalent set-up, where the mass pushed against a spring instead of being suspended. It can be shown from Newton's laws that the total momentum of a system free from outside forces is conserved; that is actually another formulation of the conservation of the center of gravity, mentioned in the discussion of rocket propulsion. Therefore the momentum given to the pendulum in one direction had to be equal to the momentum mv imparted to the rocket's gas jet and that momentum determined the length and height of its swing. By weighing the rocket before and after firing, Goddard could derive the mass m of the ejected gases and from that deduce v. For a 1-pound Coston ship rocket, he found that v was about 1000 ft/sec (300 m/sec). A rocket is essentially a heat engine, a device for converting the energy of heat (obtained from the chemical energy of the fuel) into mechanical energy--here the kinetic energy mv2/2 of its exhaust jet. Knowing m and v, Goddard could derive the kinetic energy given to the gas, and by burning a measured amount of the fuel, absorbing the heat (e. g. in water) and measuring the rise in temperature, the total amount of chemical energy converted to heat could also be obtained. The conclusion was rather disappointing: only about 2% of the available energy contributed to the speed of the jet. Could this be improved? Luckily for Goddard, this problem had been solved by Gustav De Laval, a Swedish engineer of French descent. In trying to develop a more efficient steam engine, De Laval designed a turbine whose wheel was turned by jets of steam. The critical component, the one in which heat energy of the hot high-pressure steam from the boiler was converted into kinetic energy, was the nozzle from which the jet blew onto the wheel. De Laval found that the most efficient conversion occured when the nozzle first narrowed, increasing the speed of the jet to the speed of sound, and then expanded again. This expansion caused a further increase in the speed of the jet and led to a very efficient conversion of heat energy to motion. Nowadays steam turbines are the preferred power source of electric power stations and large ships, although they usually have a different design--to make best use of the fast steam jet, De Laval's turbine had to run at an impractically high speed. But for rockets the De Laval nozzle was just what was needed. Goddard experimented on his ballistic pendulum with various nozzle designs, using a small metal combustion chamber filled with a type of gunpowder, ignited by electricity. The end of the chamber was threaded, so that nozzles of various designs could be screwed onto it and tested. Using a De Laval nozzle, he obtained jet velocities between 7000 and 8000 ft/sec and efficiencies of up to 63%. Later he replaced the ballistic pendulum with a more compact device, in which the thrust of the rockets did not lift a pendulum against gravity but compressed a calibrated spring. With that device he showed that (contrary to some popular claims) rockets worked just as well in a vacuum. As Goddard himself noted, that made the rocket the most efficient of all heat engines, better than piston-driven steam engines (21%) and Diesel engines (40%). No wonder: from the second law of thermodynamics, the theoretically attainable efficiency of a heat engine increases with its operating temperature, and no other heat engine runs as hot as a rocket. De Laval's nozzle turned spaceflight from a vague dream into a real possibility. Goddard communicated his results to the Smithsonian Institution in Washington and asked for support to develop a rocket capable of probing the high atmosphere. His original plan (the "reloading feature" in his priority list) was to feed the combustion chamber with solid chunks of fuel, somewhat in the manner in which bullets were fed to a machine gun. In January 1917 the Smithsonian responded with a grant of $5000, and Goddard began his rocketry career. After the US entered World War I, Goddard also worked for a while on military rockets, but none of his designs were implemented, though rockets somewhat similar to his design were turned in World War II into an effective weapon against tanks, known as the bazooka (a variant of this is now the "rocket propelled grenade" or RPG). Note: The autobiographical book by Homer Hickam "October Sky" (anagram of its original title "Rocket Boys"; later made into a film) tells of a group of high-school students in a poor Appalachian coal-mining town who, taken by the idea of space flight, design and fly home-built rockets of greater and still greater range. Their break-through comes when they discover in a book the design of the De-Laval Nozzle. The idea of feeding the rocket with a continuous stream of solid charges also proved unfeasible, and in 1922 Goddard went back to his alternative idea, proposed independently by Hermann Oberth in Germany and also noted by Tsiolkovsky: a liquid-fuel rocket. It would have two lines running into its combustion chamber, one feeding fuel, the other oxygen, similar to the way a steel-cutting blowtorch operated, except here both lines carried liquids, not gases--in Goddard's design, gasoline and liquid oxygen. Such a rocket promised very high efficiency, but also posed serious technological challenges. Both fluids had to be pumped at a steady rate, and one of them, liquid oxygen, was extremely cold. 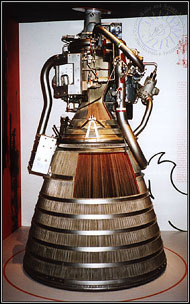 The high temperature of combustion in pure oxygen required heat-resistant materials, and to help overcome this, Goddard developed the technique of having the liquid oxygen cool the combustion chamber on its way from the fuel tank. This method is still use: in the picture above, the nozzle and the "bell" guiding the expanding jet are lined with a large number of metal pipes, through which the cold fuel flows on its way to the combustion chamber. from the tank at the bottom. Another completely novel problem which faced Goddard was the guidance and control of the rocket in flight. 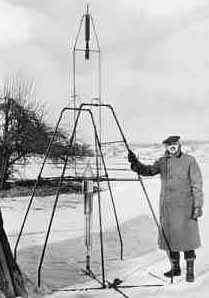 On March 16, 1926, Goddard flight-tested his first liquid-fuel rocket. He thought stable flight could be obtained by mounting the rocket ahead of the fuel tank, with the tank shielded from the flame by a metal cone and the lines for fuel and oxygen pulling it behind the rocket: the design worked, but did not produce the hoped-for stability. The rocket burned about 20 seconds before reaching sufficient thrust (or sufficiently lightening the fuel tank) for taking off. During that time it melted part of the nozzle, while the camera with which Mrs. Esther Goddard was trying to record the flight ran out of film, so that no photographic record of that flight remains. Then it took off to a height of 41 feet, leveled off and later hit the ground, all within 2. 5 seconds, averaging about 60 mph. Goddard's concept seemed validated, but he was still far from a practical design. Unfortunately, he worked in isolation, without the engineering resources of a major institution. In the years that followed he continued developing his rockets--controlling their motion by gyroscopes, steering them with small vanes thrust into their exhaust jet, and building larger and faster rockets. For testing the rocket engines were tied to frames on the ground, and some were also tested in free flight, mostly at a rocket lab he established in Roswell, New Mexico. But the actual realization of his dream fell to others who enjoyed military or national support. Goddard, unfortunately, never lived to see the age of spaceflight. He died of cancer on August 10, 1945, in Baltimore. Another picture of Goddard, retrieving the remains of one of his rockets after a flight, with descriptive text. The ballistic pendulum was apparently invented by a Benjamin Thompson, better known as Count Rumford, whose career started as a schoolteacher in Concord, New Hampshire; his life was studied by MIT physics professor Sanborn Brown. In the American Revolution, Thompson was actually a loyalist, a supporter of the British government who at age 20 became a major in the British militia. When the revolutionaries forced the British army out of Boston, Thompson went to Britain and served its government, both in politics and as scientific adviser. To evaluate the efficiency of gunpowder, he devised the ballistic pendulum, a heavy suspended target into which a small cannon was fired; from the rise of the target, the speed of the bullet was derived. He later entered the service of the duke of Bavaria, where he received a title of nobility "Count Rumford," Rumford being the old name of Concord. Later he lived in France, while in England he founded the "Royal Institution" in London, a center for science research and popular lectures, the place where Humphrey Davy and Michael Faraday worked and lectured. He conducted many pioneering experiments and even invented the drip-method coffee maker.